Perfect Parallel is pleased to provide an open Alpha of our physics engine in operation on our purposely built practice range. Perfect Parallel is pleased to provide an open Alpha of our physics engine in operation on our purposely built practice range. We have decided to provide this as an open alpha test as a thank you to everyone who has supported us as we have tried to move closer to seeing our own vision and reality come true. In future we will be providing much more alpha and beta content and we may make this content available through a mini kickstarter we will launch on this site. In this build there is no golfer and there is no swingmeter, but you can change all the values that are core to our physics engine within the game environment and you can also save your settings and load them again when you play. For now this is available as a windows executable but we hope to release in MAC format and maybe even web format very soon. Instructions can be found on the initial splash screen. As always we welcome your feedback. That was good fun! Well done. First - at the risk of sounding a bit dense (a risk I'm willing to take) - how do you quit? -let's race carts on that long path! Really nice start. Really looking forward to creation tools. You have to register an account to see the download- just a heads up to other lurkers. After just 45 minutes of playing around I am blown away- xbox controls are amazing (once you lock into the xbox- look up and down control interface). Ball flights and rolls were great, bounces back to bunkers, hitting trees- gave real life performance. Will test it some more tomorrow night- just can't wait for this game. Having problem running the program. I enter my username and password that I am registered here with, but nothing happens when I click OK. What am I missing? This is great fun! Once I figured out how to rotate the ball launch I was launching balls like missles! haha. I had the graphics on "fastest" and it looks unbeleivable! I'm so excited for this game. The only issue I had was the ball camera ("F" key on my PC?) didn't seem to load. I had the same problem with entering my username and password didnt want to launch. I have a somewhat different issue...the icon is clicked & goes to the sign in screen, I do that successfully & it goes to the screen size screen gives me the option a 1280 x 720 size @ full screen. I click ok it fizzles out, acts like it is trying to load but doesn't & crashes. Use win7 64 bit, athlon X3 2.9 ghz, 8 gb ram & ati 7770 pci card. Running avast 8.0 free & comodo 6.2 firewall. Any help is appreciated. When I click ok I get a full blank screen with a blank mini-screen centered that is labeled pga...NOT MUCH FUN LOOKING AT THAT. Any clues anyone? Es funktioniert nicht. Nur ein schwarzes Fenster mit Meldung "pga range", egal bei welcher Auflösung. Had a good look at this today. Took some playing around to get the feel of it and it plays great. Good start guys. Well done. I also get a username /pasword prompt thta does not accept my ID from here. Several people are having this issue now, has anyone solved It? Played around with it for about 30 minutes. Love the graphics on max. Good start to the development. Putting seems weak as if full power putts dont go far without changing green physics but hey its an alpha test of a driving range so cant expect much just yet. Excited to see this get developed into a released game. I got to play with it a bit this past Saturday. I like what I'm seeing so far, although it would be nice to have a downrange cut camera to get a better look at how the ball is reacting on the other end of the shot. I like the direction this is taking so far though. I'm really curious to see how this could take root on consoles, especially next-gen, but I'd take it on current-gen XBox 360 or PS3. Don't forget you can use the w,a,s,d keys and your mouse to move around the practice area to look at shots from different perspectives including close to the ball's landing spot. I REALLY LOVE THIS, great work devs. I haven't had much time with this with work and all. I'll do that the next time I have a chance to sit down with it (tomorrow), and thanks for the reminder of how to do that Mike. I really didn't have much time when I ran the Alpha, and obviously, I didn't read the notes completely, or I would have known this. It's a really good sign that you guys are already giving this much attention to the camera production in the presentation of the game! I had the problem also. i finally had to create another account with a new username and it went off without a hitch. The site recognized my original username, but it was like I was not an authorized user. I clicked on the "resend validation" link several times over the course of a week and never got a validation e-mail. When I entered the new account, everything was done in less than 10 minutes. Man oh man, can't wait for the real game. Played with it for about 30 mins. Hit a ball that rolls into water and it took about 20sec to sink/roll to the bottom. If game play is for ball to come to rest before next shot, then it could seem to be a long wait. Will paly with it over the few days. We're hoping to get the physics to the point where we can skip the ball off the water under certain circumstances much like they do in practice at Augusta's 16th hole. You must register AND be signed in - in order to see this downloadable content in the downloadable section. 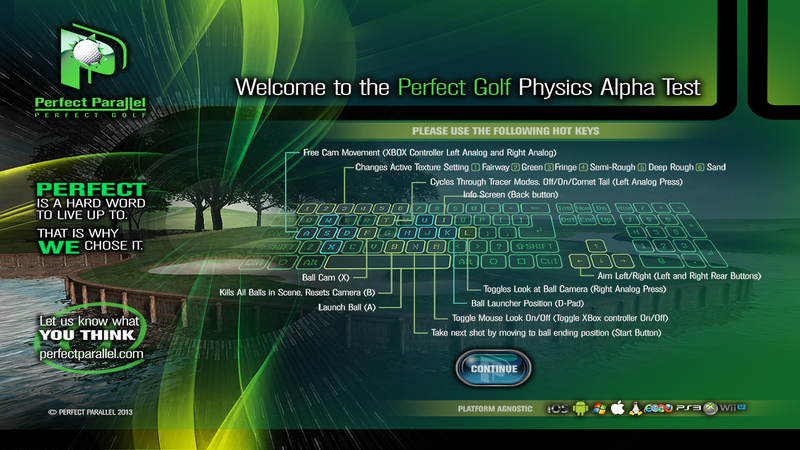 Attention all Golfers, Caddys, golf balls and groupies in the event you download and use this "Physics Test Alpha Build" perhaps, for those of you that did not, give constructive and MANY comments regarding the build in order to help out the mission. Thank you .... just a thought that at some point we should give lots of info to the Parallel People so that they can have many more ideas and understanding of how the community is relating to the game. The way to exit the program is to ALT - TAB then Right Mouse Click this program on your taskbar and select Close program or exit. I ran the program the Insane graphics setting and choose the resolution of 1680 x 1050 which is the same as my desktops resolution. I am using a SyncMaster 2233 that has a 20000:1 Dynamic Contrast this is an older monitor and I do not believe it is made anymore but it is or at least was at the time a decent monitor. It is a widescreen. ok so at the Welcome Screen maybe have a statement saying something like you can access this screen at anytime by pressing F1 once you are in the Alpha Build. (I eneded up using Fraps to get a screen shot of the controls but then when finally started the game I realized I could just hit F1 at anytime .. anyway.) Also, maybe tell people how to get back out of it once they want to exit. Ok so with Insane graphics on and using Full Screen with resolution of 1680 x 1050 everything looked great and ran fine. When I was in free mouse move and panned around it was slightly blurry as I spun right and left but that is because my monitor speed is not real fast. When I flew around using the keyboard W, S, A, or D keys or the Q or E to go up and down everything was fine no blurring . Shots into the sand had no visible sand flying but with the Epic beauty and graphics and physics who cares but it might be something your going to fix in the future .... no sand flying out when hits out of sand either. Twice my ball was never shown though it hit and I guess stopped on the green but when I shot from a different spot onto the green they always showed up. When on the green putter at even full power only lets us hit it a few feet perhaps this will be tweaked later but we will need to be able to easily hit it from one side of the green to the other right or from the fringe close to the hole. ??? (because people like me don't knock it next to the hole every shot.) Regarding the Fringe it looks cool but seems no different than being on the green but perhaps this has not been tweaked yet. Had lots of roll I mean lots of roll and roll and roll whilst hitting into the slope of the fairway had to bump the friction up to .88 or higher. Water shots we fine I even swam down into the water and hit it out of there. The water looks absolutelly fantastic. The wild flowers look great too. And the Waterfall and all the sounds are so welcome. Even the bird moves a little. The light green bush where one initially starts at .. this bush kind of like shudders rather than blows in the wind. But if i was actually playing a hole I would probably not even notice it. The distance background looks fantastic too. The PGA flag and colors is a nice touch with such attention to detail. The clouds look like I'm outside looking up. I hope at some point consideration will be given to the concept that some of us may want total realism and therefore may want this to be very hard to ever hit under par this is perhaps realistic but often in golf games it can make many of us be convinced that there is no point in figuring out the wind, lie of ball, distance, slope because unless the game has like an arcade mode we will never hit a good shot or if we do it was an accident. I just hope it is not going to be frustrating like many golf games are it seems one has to play on either arcade setting or aggravation mode there is no inbetween. I hope attention will be given to this area too. The graphics is going to set the new standard hopefully the overall expierience will too. There is a golf game out there that is somewhat remotelly like this one in that compared to the franchises that produce the yearly golf game this other one had a much better course creator, and much more realistic physics except that you could only play against a computer component that looked graphically as pathetic as you did but they always hit great shots and like 5 to 8 under par whereas your person even on an easier setting always go a ways over par. When one choose better accuracy vs distance it game much less distance but no better accuracy the darn thing was to frustrating. I mean ya had to hold a piece of wood in your left hand and with the right hand on the mouse using true swing slide the mouse on this straight edge to get an decent shot and this was on the "arcade setting" so to speak .. it was to much of a pain to enjoy it. It is a had balance to make so I figure just make the hardness of the swing vs the easiest of the swing very tweakable give the user many options maybe even a choice of a random errant shot that occurs no matter how well they hit the ball but then have it too to where they can set it to where they can often hit the ball well even though they don't move there mouse pefectly. Ultimatelly I think this is what will sell the most games if it is enjoyable for everyone meaning it will need a lot of different difficulty settings. one other thing the tops of the pine trees have a white color like they have been cut off like a white dot at the tops of each pine tree.